The Girls Club is an enhancement program designed to encourage healthy attitudes and lifestyle that will enable early adolescent girls to develop their full potential. It seeks to assist the girls to cope with their family and personal problems whilst at the same time assisting the girls to learn valuable life skills. The club is composed of girls aged from between 12 to 25 years old. At present the club has more than twenty members, most of whom are residents of the local community. The girls meet every Saturday between 1:00pm and 3:00pm to have regular meetings with VFV staff. 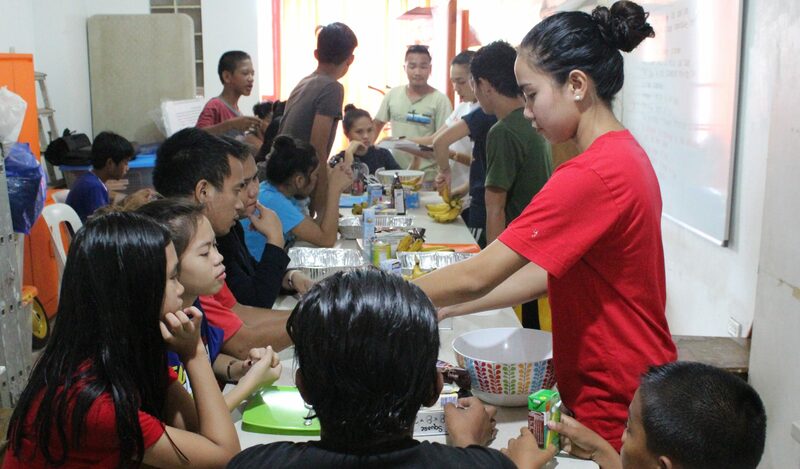 Regularly, the girls have activities inside the center, such as culinary sessions, craft-making, dance lessons and workshops. Just like the Boy’s Club, the girls too learn the values of voluntarism and sharing whilst at the same time developing new skills which will benefit them in later life. By constantly monitoring the girls feelings and behavior through activities such as one-on-one counseling we can determine the kinds of actions that cause them to be in difficult situations. By trying or helping the girls to analyze the situations they are in, VFV can help them enhance their capacity to make active choices. The feeling of competency gained from developing skills and talents can do great things to bolster the girls self-esteem. The Club offers opportunities for girls to explore their talents in many areas, including sports, academic interest, music, arts, drama and crafts. Make a donation and contact us about developing a livelihood projects or facilitating a skills training session. With additional funding we can establish and develop entrepreneurial skills with the boys so that they can develop small businesses to help supplement their education or households.